It is not common for people to get sore necks and backs from working at a desk, hunched over, and typing away on a keyboard. Developing better posture and switching to an ergonomically designed keyboard can help office workers decrease the discomfort they experience sitting at a desk all day. While welders do not spend their working hours sitting a desk, they are no less likely to suffer discomfort from bending over during the welding process. 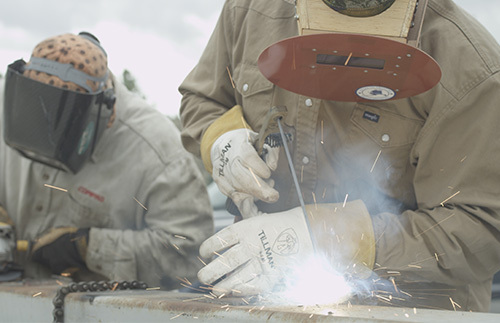 Welding safety focuses on the importance of applying ergonomics to welding to minimize physical harm. According to the Occupational Safety and Health Administration (OSHA) ergonomics is “is the science of designing the job to fit the worker, rather than physically forcing the worker’s body to fit the job.” You may see offices bring in odd-looking chairs, for instance, that have been ergonomically designed in order to keep workers comfortable at their desk throughout the day. Ergonomics can also address efficiency: an ergonomic TV receiver may have very large buttons or voice command to make it easy to use. The simple motions that welders perform on a given job—turning, lifting, pulling, or bending over—may not be hazardous on their own. However, welding often requires standing and moving in tight spaces and other awkward positioning. One of the most common ergonomically hazardous position for welders is simply keeping an awkward or static posture. 1 Hopefully, students taking welding classes learn the proper ergonomic solutions to welding to avoid injuries at work once they start their careers. Work on adjustable tables in order to bring a weld up to eye level. Keep your elbows close to your body, support them if you can, and avoid positions were arms are raised above the shoulder level. Use lighter tools and suspend them. Work with jigs and fixtures. When talking about the risks of welding, posture is important. You can apply ergonomic behavior and equipment—that is, working with your tools and body to create the safest situation—to make sure you don’t create strains on your body from static poses or uncomfortable motions.